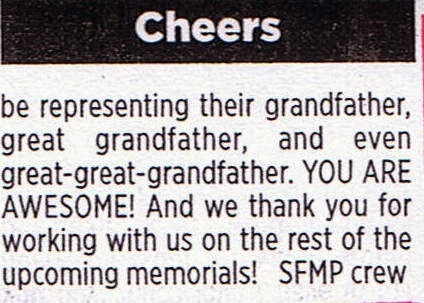 Ah, the warm-fuzzies are surely nice and directed to Charles they are most deserved. Lola King McCreary was not present to receive her award but was also recognized by EWGS and then WSGS for her service to EWGS. 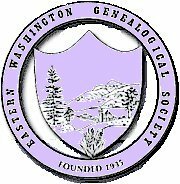 Members of the Eastern Washington Genealogical Society are great folks and are accomplishing great things! A wonderful opportunity awaits those of us who have research to do in Illinois! 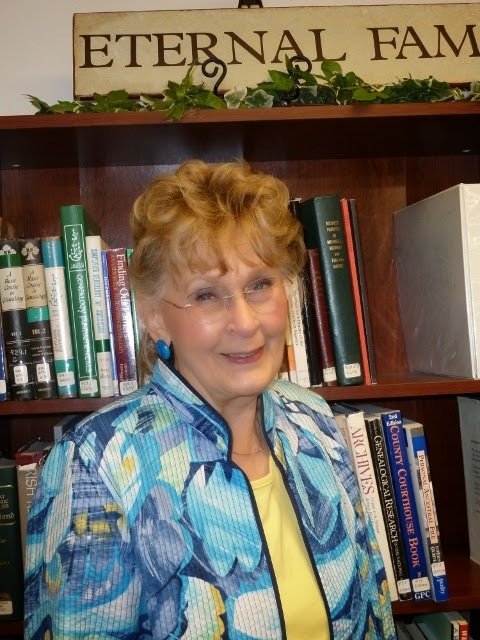 Luana Darby will present a FREE webinar on Tuesday, September 9th, at 6:00pm our time, on understanding and using the Regional Archives of Illinois. You must click on the link below to register for this live webinar; I suggest you doing it today for even in the digital world only so many can attend these webinars. A confirmation email will come to you. Then all you have to do it at the appointed time have your computer turned on and plan to sit and "attend" this seminar presented as a webinar and take notes and learn! Easy as raking pine needles. 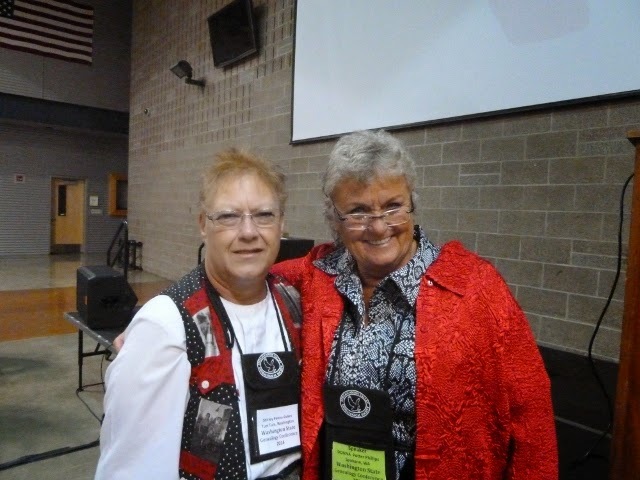 Barb Jolly became aware of the importance of networking during EWGS social time when Jennifer Saunders, her neighbor in Ritzville and new EWGS member, asked if anyone else was having challenges with the MAC doing family history. Barb asked Donna Phillips to help. Donna introduced Jennifer to Bill Hire who was an expert on the MAC. Jennifer found answers. The following skit is a true story of what can happen if you network during EWGS social time. Statistically what happened is about a zillion to one---but it did! Scene 1: Barb Jolly visits friend John Timm whose cancer has put him in Hospice. She asks John what he knows of his family history. Answer-"My best friend Barney Streeter & I have always called each other "Cousin"--Are we?" Barb goes to work on John's family history. Scene 2: Evelyn Wilhelmson, EWGS member, is asked by Jan Parr to research her family history. 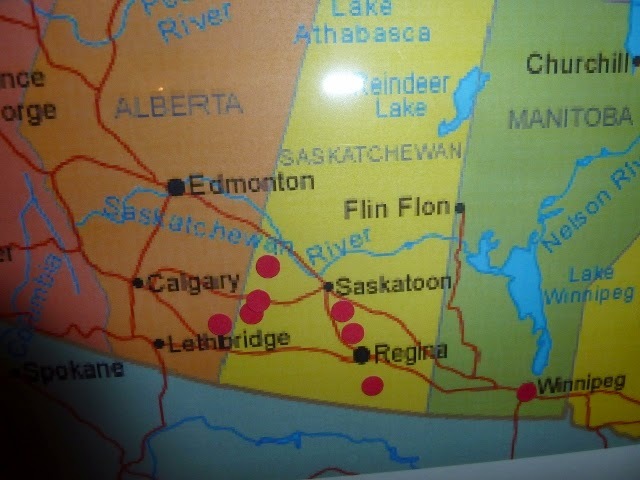 While researching, they find they are related on the Herrick line. Jan is also the daughter of Jackie Streeter from Ritzville. Scene 3: Evelyn & Jan visit Ritzville Chamber of Commerce in search of the Streeter line. Jennifer Saunders, EWGS member, is in charge of that office & sets in motion their search which results in Jan's attending Barney Streeter's funeral and the chance to meet her relatives on the Streeter side. Scene 4: EWGS social time. Jennifer Saunders meets up with Evelyn. Jennifer remembers that Barb is researching the Timm/Streeter line & introduces Evelyn to Barb. Scene 5: Barb arranges for John, Evelyn & Jan to meet on John's front porch in Paha, WA, where they discover that all 3 of them are related on the Herrick line. They spend an enjoyable afternoon sharing stories of their family history. What are the odds of these 3 meeting and finding out they are related? How are you spending your time at EWGS? Do you have questions that might be answered by someone in the room? Networking works! Our very own newspaper, The Spokesman Review, carries weekly articles (complete with new-and-old photos) about the history of Spokane and the area. Stefanie Pettit compiles the Landmarks columns, and Margaret Cowles and Jesse Tinsley offer the Then And Now stories. Both are wonderful! To me, these columns are a major reason to take the daily paper. 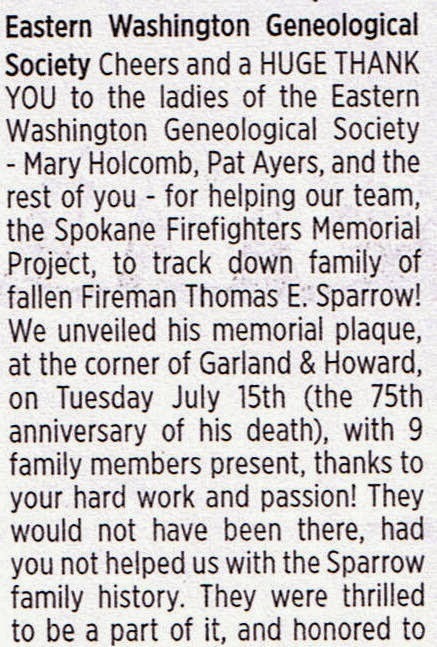 I've clipped out the articles and have a nice folder of Spokane history............. after all, it was not other people's ancestors who made this history but was mine and hubby's and probably yours too. Give these sites a looksee....... and consider subscribing to the paper so you can enjoy them weekly in the paper with your morning "cuppa." "Everyone has a story. Is yours German Russian?" So begins a colorful brochure for the GRHS (Germans from Russia Heritage Society). I was honored to be a speaker last July 25 and 26 at the Davenport Hotel here in Spokane for their annual conference. Did you know that there are two similar groups, the Volga Germans and the Black Sea Germans. The Volga area was settled by Germans accepting Catherine the Great's invitation in 1763 to come settle. The Black Sea groups came fifty-some years later but in greater numbers. I was told that there were 100 "mother colonies" around the Black Sea with 30-40 families in each colony, for a likely total of about 25,000 people. The membership of the GRHS is made up primarily of the descendants of the Black Sea Germans. 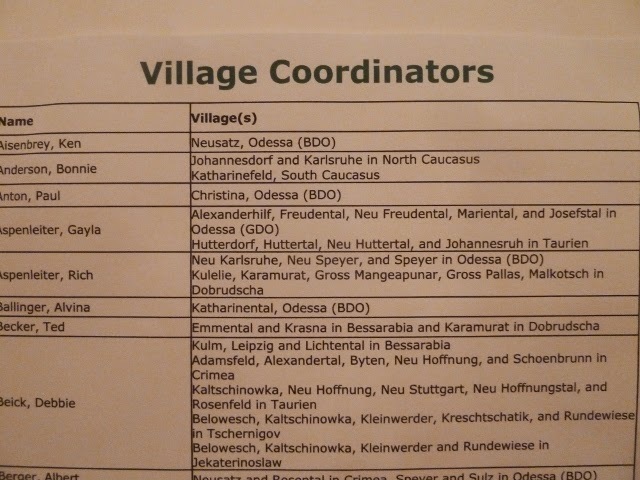 The folks attending this convention are lucky in a sense because they know the villages in the Black Sea area where their ancestors were for a century, and many even know the village back in Germany where they originated! 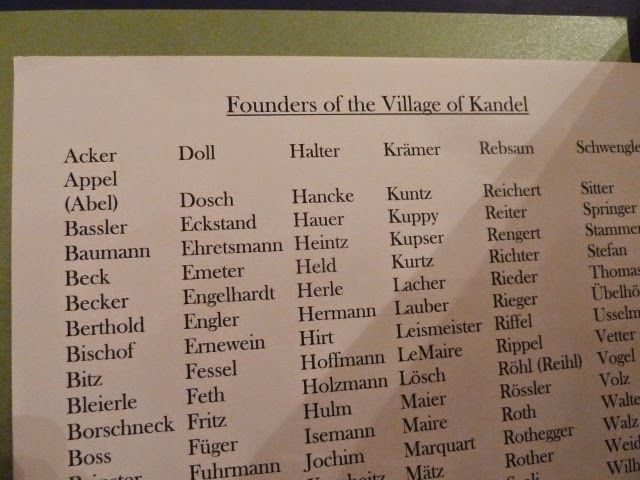 Today, each village has a Co-Ordinator and there are published lists of surnames from each village. 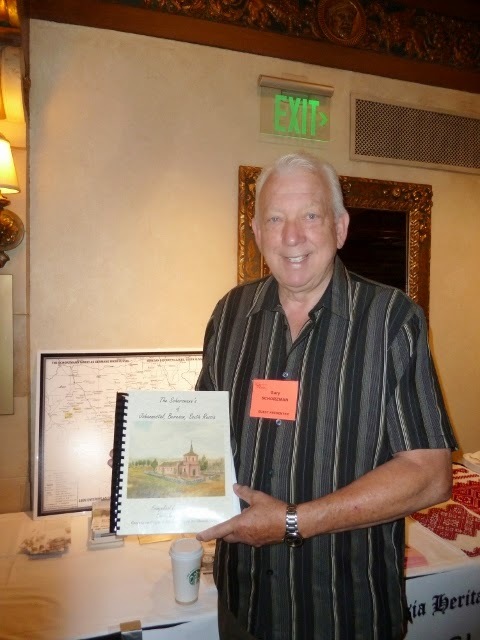 At the conference, I met William Gary Schorzman who was vendoring his books and he donated a copy of all three books to the EWGS genealogy collection! His books were: The Schorzman Chronicles, one volume "featuring Christian and Christina Ulmer-Schorzman of Odessa, WA," and the second volume featuring "Jacob and Anna Christina Ulmer-Schorzman of Quincy, WA." The third book author Gary Schorzman donated to EWGS was titled The Schorzmann's of Johannestal, Beresan, South Russia, Evangelical Lutheran Kirche. All three of these books are huge, 350-400 pages! May I introduce you to the author; he's holding the Kirche book. EWGS member Kent Aggers was there among folks from as far away as Florida. These folks are serious! If you want more information on the Germans from Russia Heritage Society, with its headquarters in Bismarck, North Dakota, visit their website: www.grhs.org . 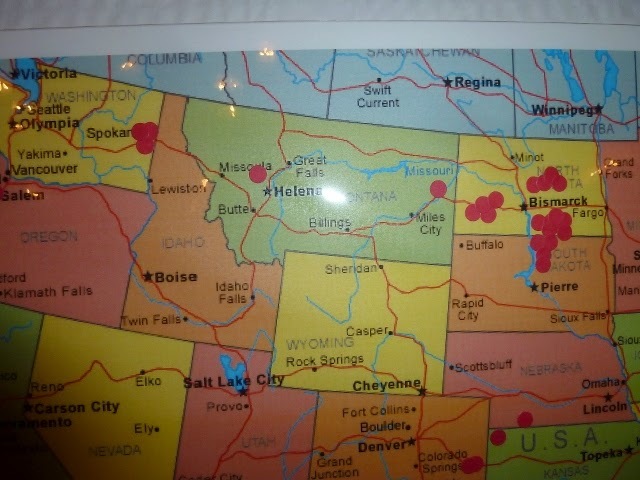 I understand that the 2015 conference will be in Bismarck. This is a copy of the Cheers article in the Inlander newspaper July 24, 2014 page 60, thanking Eastern Washington Genealogical Society library helpers by the Spokane Firefighters Memorial Project. They are putting a memorial in the sidewalk close to where each Spokane Firefighter died. 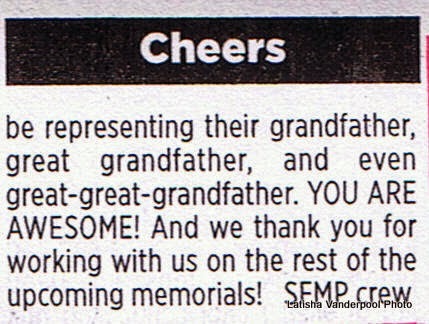 I know the volunteers will appreciate the thanks.